History: (Marvel Universe Millennial Visions 2001 - "The Marvel Universe: Hammer Time") - Odin bestowed his son Thor with a mystical Uru hammer called Mjolnir and cast an enchantment on it that allowed anyone who touched it, if they be worthy, to gain the power of Thor. Unfortunately, Thor failed to impress his father Odin by saving the Earth dozens of times and Odin thought his son to be lazy, overconfident, unachieving, and a delinquent. In order to punish his son, Odin took away Mjolnir from Thor and decided to give enchanted Uru hammers to Thor's allies in the Avengers. While Thor now carried a normal carpenter's hammer, Odin thought to himself that perhaps his son would one day become a doctor. Comments: Created by Chris Giarrusso. 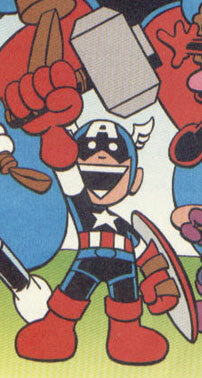 Captain America was pretty much the same as his Earth-616 counterpart up until Odin gave him an enchanted Uru hammer similar to Thor's. 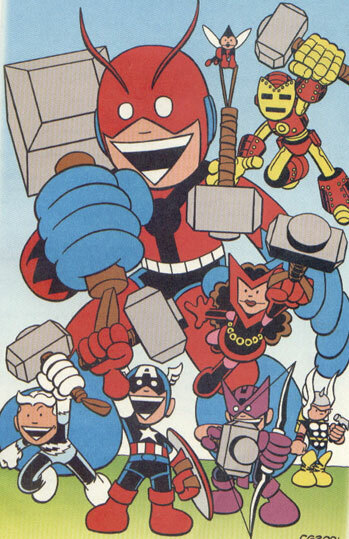 --Marvel Universe Millennial Visions 2001 - "The Marvel Universe: Hammer Time"
Giant-Man was the same as his Earth-616 counterpart until the Asgardian god Odin bestowed upon his an enchanted Uru hammer. 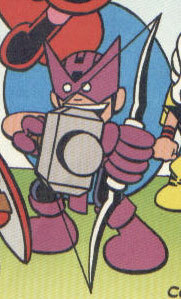 Hawkeye was the same as his Earth-616 counterpart up until he was gifted with an enchanted Uru hammer, which he used like he would any other arrow. 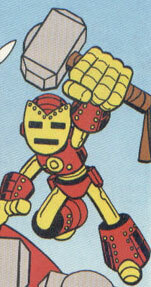 Iron Man was the same as his Earth-616 counterpart until he recieved an enchanted Uru hammer from the Asgardian god Odin. 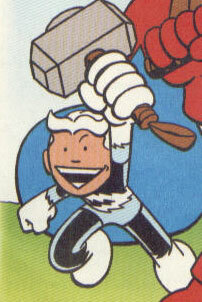 Quicksilver was the same super-speedster that his Earth-616 counterpart was up until he was given an enchanted Uru hammer. 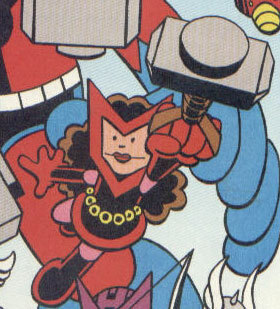 Scarlet Witch was the same as his Earth-616 counterpart until she was given a mystical Uru hammer. Thor was the same as his Earth-616 counterpart until he failed to prove himself to Odin, who punished Thor by taking away his Uru hammer and giving his Avengers comrades hammers of their own. Without Mjolnir at his side, Thor took to using a regular carpenter's hammer. 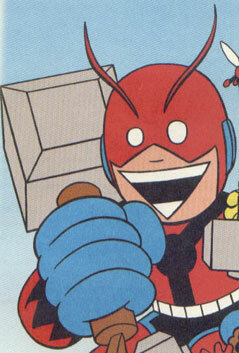 The Wasp was exactly the same as her Earth-616 counterpart until she was given an enchanted hammer as a weapon.